Drought is one of the major constraints to the productivity of rice in many parts of the world. The breeding for improved drought resistance types of rice has been slow. 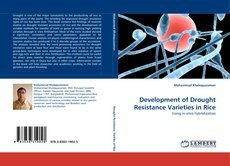 This book contains the findings of research studies on drought resistant accessions of rice and the development of suitable methods for transfer of traits or genes in existing high yielding varieties through in vitro fertilization. Most of the traits studied showed a significant correlation and some parameters appeared to be interrelated. Cluster analysis on physio-morphological characteristics and isozyme studies has produced 4 to 6 discrete groups of the accessions. The analysis revealed that the most promising accessions for drought resistance were at least four and these were found to be in the same group.New techniques were developed for in vitro isolation of sperm and egg cells and their in vitro fertilization. This method could be useful for direct gene transfer through regeneration of plants from fused gametes, not only in Oryza but also in other crops. Information contain in the book will help researcher and academics working in the field of genetics and plant breeding.